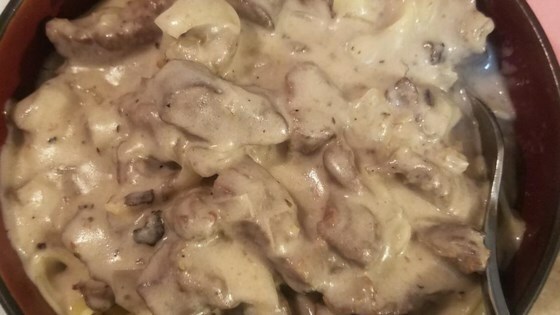 "This is an easy and very good recipe that my family loves, cooked with venison." Season venison with salt, pepper and garlic powder to taste. Saute onion in a large skillet; when soft, add venison and brown. Drain when venison is no longer pink and add soup. Reduce heat to low and simmer. Meanwhile, bring a large pot of lightly salted water to a boil. Add noodles and cook for 8 to 10 minutes or until al dente; drain. When noodles are almost done cooking, stir sour cream into meat mixture. Pour meat mixture over hot cooked noodles and serve. Neither my husband or I liked this recipe. It did nothing for the venison taste plus the cream of mushroom taste was very overwhelming. Wonderful meal! My husband loved it and the girls actually liked the deer meat in it! A very good way to dress up venison!